In recent years, highly publicized data breaches have elevated the need for vendor risk management. In this year’s Verizon DBIR report, 70% of incidents observed involved a secondary victim where the victims were targeted and infected through an unknowing third party, like a vendor. Yet despite the alarming number of third party breaches, Gartner estimates that fewer than 15% of vendor management programs will leverage data analytics and business intelligence to identify and manage risk through 2016. 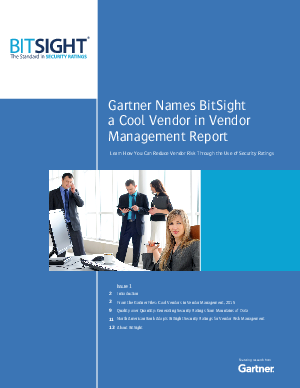 BitSight Security Ratings provide evidencebased measurements of security performance, enabling organizations to continuously monitor the security effectiveness of third parties.